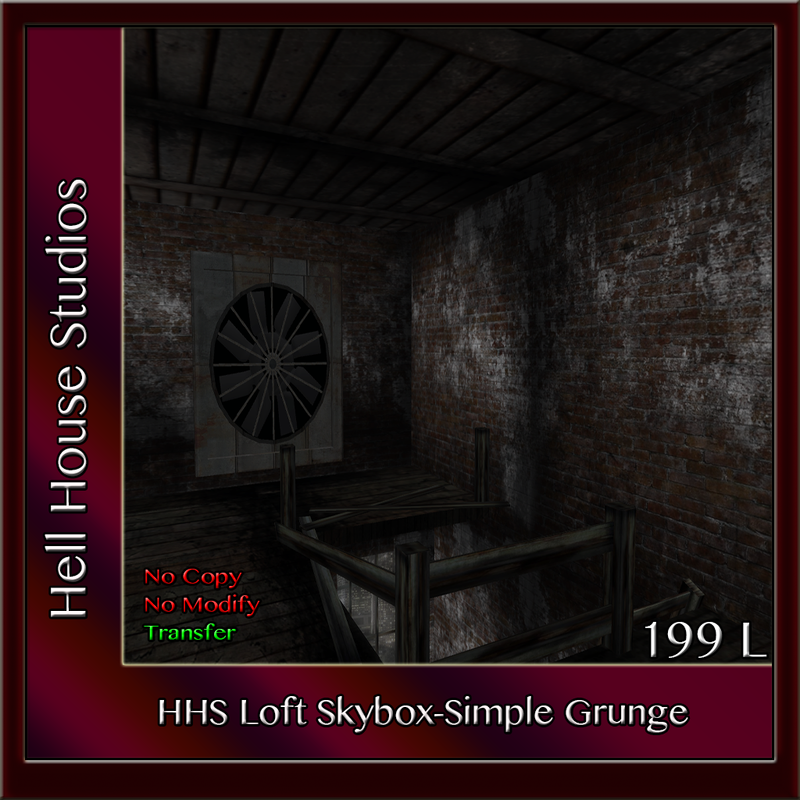 Hell House Studios is now offering The Old Shack. This is a small, extra low prim, darkly dilapidated, home for you to furnish. Also, makes a great *rental home or RP prop for those darkly delightful role play areas. *For those looking to set-up rental homes, contact me In-World to discuss a bulk discount rate. Thank you for viewing our product(s). We do appreciate YOUR business with us. 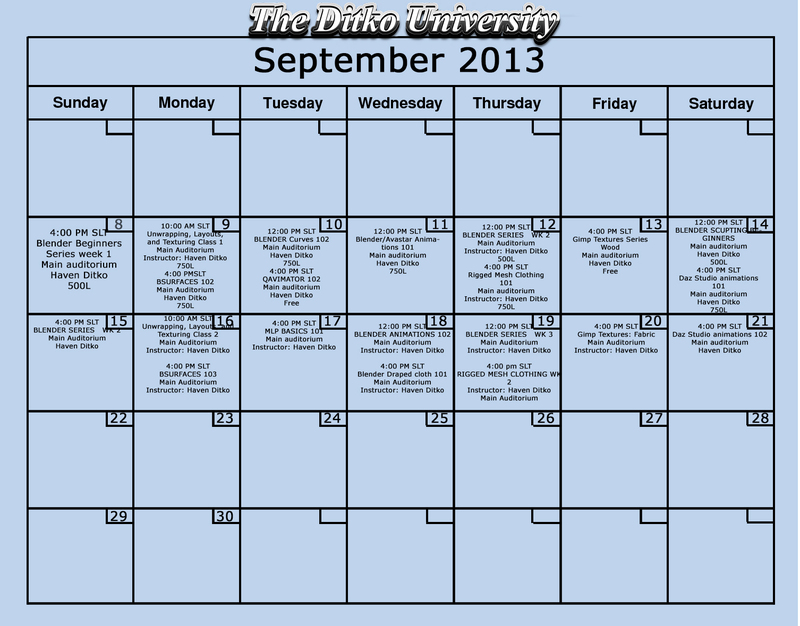 Ditko University Classes for this Week. Yep, this is a few days late folks...all the more reason to join the group and received the information when it is hot off the press. Subscribe to the blog or, join the in-world group. If you haven't taken it already, check out the Spin Tool class or the cloth draping class...both were fun, informative, and very useful techniques. Also, a couple of new teachers are coming on board to teach new things...so check out DU's Blog or this one for more information as it comes along. Yes, I have been rather lax lately....MY apologies. I know this is a bit late. Being a member of the Ditko University Group will see you get these notices much quicker and keep you from missing valuable knowledge. Joining the group is FREE!!!! You can also access the class schedule by clicking on the URL below to take you directly to the page. Sign-up to follow the blog to avoid missing out on anything! In the meantime, here is the calendar for the rest of the week. Updated June 6, 2014-Updated information in italics. 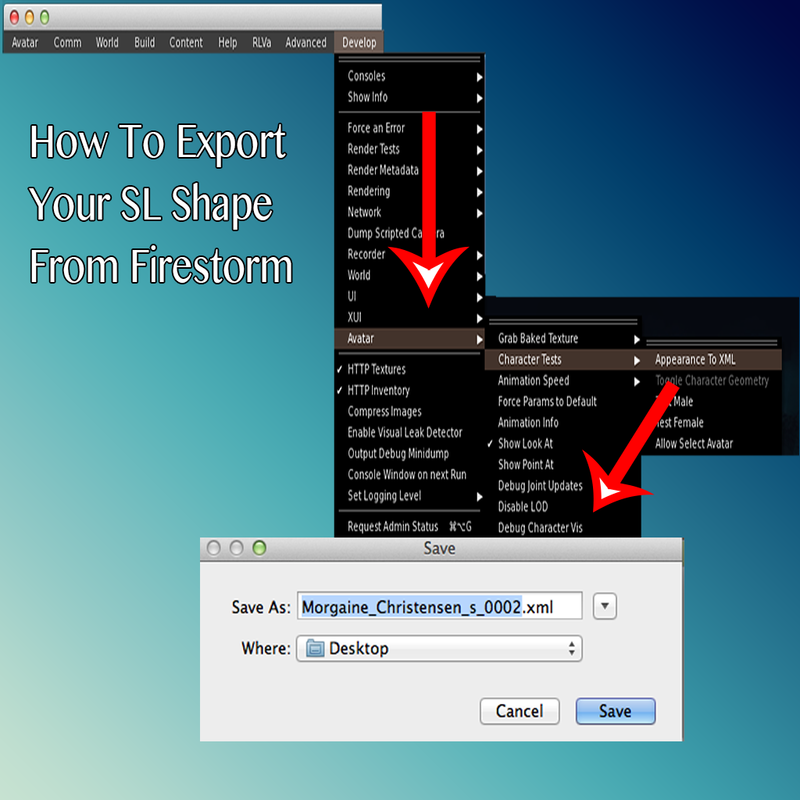 Today, we are going to cover importing the Standard Sizing Shapes .xml file(s) we created in Part 1 into Blender and how to manipulate it a bit before exporting to use in Marvelous Designer. Most of you, with Blender experience, will have no issue with this part of the series. If anything, I may have over simplified the process so please bear with me. 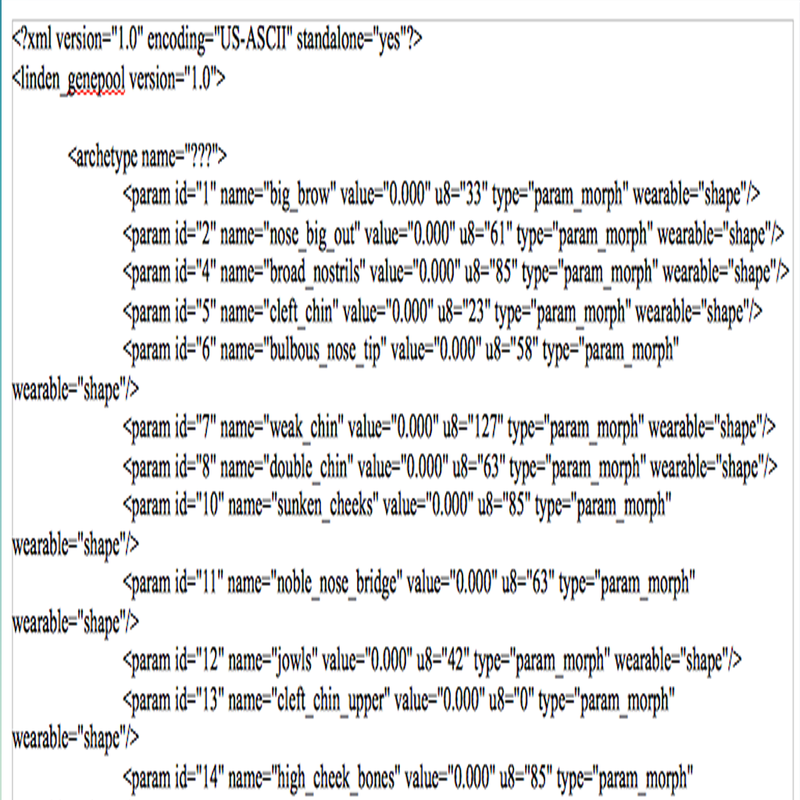 The instructions being given below are using a Mac, Blender 2.68a, and Firestorm Viewer 4.4.2. Note:...these instructions work the same way for Blender 2.70X and Firestorm Viewer 4. 6. 5, released May 5, 2014. HELPFUL HINTS: Blender is a complex piece of software. This is not a race. Take your time. Be patient. If you become frustrated, stop...step away from your computer...come back later... and try again. Like most software products, there is not a lot of information out there in relationship to Marvelous Designer(MD) and Second Life (SL), especially now that Marvelous Designer 3 has recently been released. So, as I limp along, I will try to share what I learn along the way. These are my methods that work for me; they may not be the most efficient and there may be better ways of doing things than what I am posting. But, at least you have a starting point to work from on your learning quest. As more and people are now getting on board with Marvelous Designer, there is more and more information now being published. 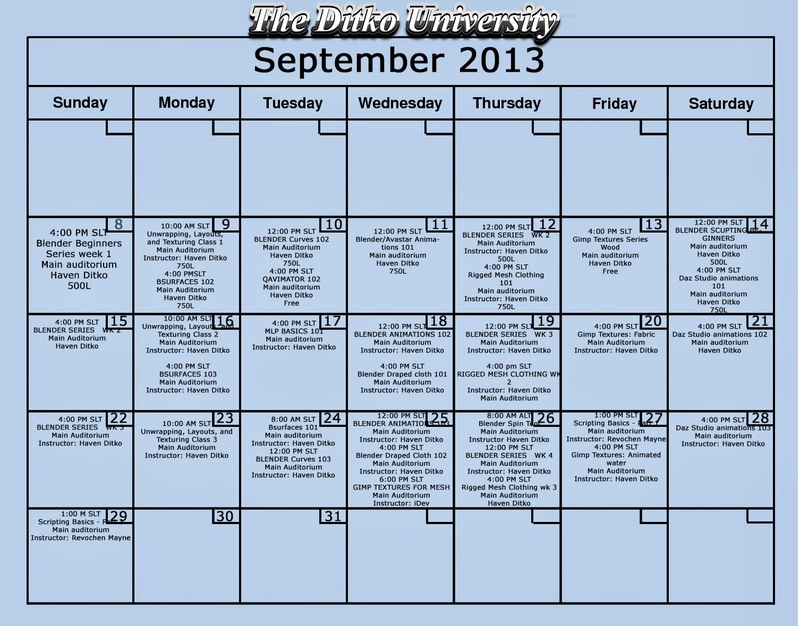 Be sure to search YouTubes for videos, Gaia Clary's Blog, Ditko University's Blog. Don't limited yourself to MD information, look at beginner real life sewing information as well. It will help you understand a bit more about Marvelous Designer. 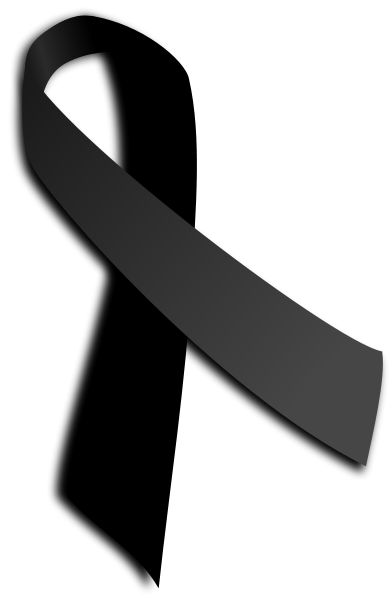 ...more that 3,000 people lost their lives in this act of coordinated terror. Secondary deaths and chronic illnesses attributed to that day are still being counted. If you do nothing else today, please stop for a few moments, reflect on all that you have and all those you know...Be thankful...it can be destroyed in a flash. 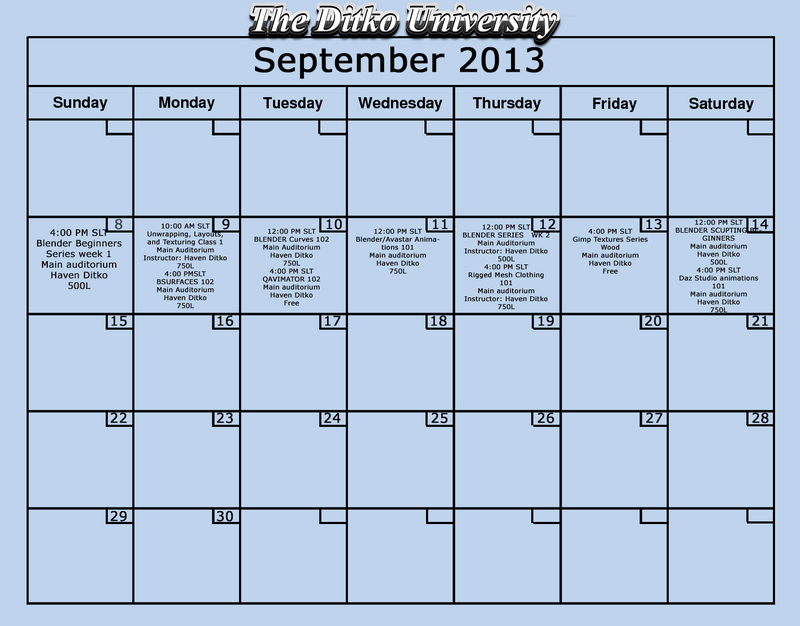 I have been remiss in posting the DU class schedule...my apologies...here is this week's class calender for Ditko University classes. If you wish to know about these classes, check out the DU Blog. I look forward to seeing some of you in class. If you have been in Second Life for any time at all, you know Second Life (SL) is really a global community. Striking up a conversation at clubs, various charity events, private parties, while out shopping, taking classes, anywhere you go you will run across all kinds of people from all cultures, walks of life, educational background, interests, etc. from around the globe. 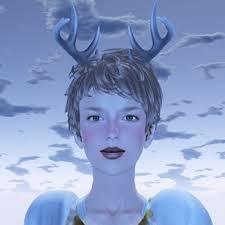 I find it fascinating and very enjoyable to meet new people in SL. Maybe it is because I love learning new things or comparing notes about our differences and similarities. I have found really no matter where we live we share so many things in common. Over the years, I have met so many interesting and fascinating people in SL. Some are around for a brief period of time while others seem to become part of the SL environment. One of those that seems to have become a permanent part of SL is the illustrious...Garvie Garzo. Want a loft that looks like a loft? Need something grungy and dark, yet will fit on a small piece of land? Would you like a home with rooms to personalize but on a land impact/prim budget? Looking for a home or RP sceneing area AND inexpensive? Read on. We are pleased to present to you this simple, dark and grungy designer-quality, sky box. It is great for both new and long-term SL Residents. Be it for rentals, personal escape, or simply a home you can relax and enjoy your Second Life. We understand you work hard for your Lindens and play in-world just as hard. When it comes to creating a comfortable and functional atmospheres for our clients, as designers and builders, we are conscious of land impact (LI), design detail, quality, and pricing.